Way back to my childhood, my mum used to make us some dumplings during Chinese New Year. 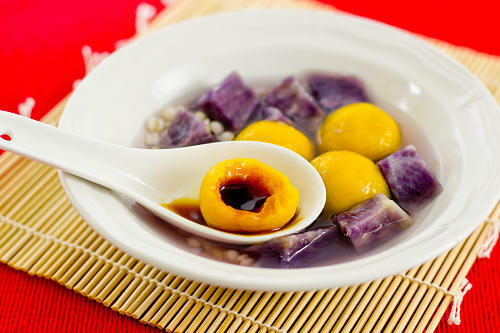 I love sipping the hot, gingery sweet soup, then with a bite of chewy glutinous rice dumplings. The melted sugar inside each dumpling adds more adventurous fun in tasting. Here’s my recent version of dumplings for Chinese New Year incorporated more vibrant colours. The bright orange pumpkin meat helps to make the dumplings look even more inviting. I experimented with adding purple sweet potato (aka purple yam), it turned out to be one of my favourite Chinese desserts. 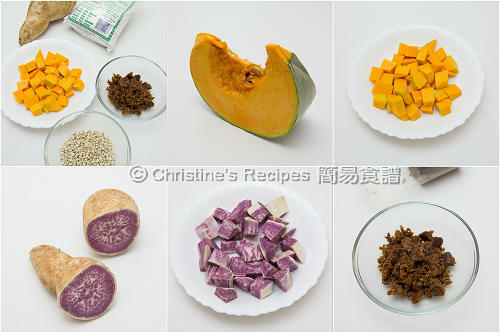 Cook the pumpkin and yam with microwave oven respectively, covered, over high heat, for about 4 to 5 minutes. (Remark: the cooking time depends on the power of your microwave oven and the size of the vegetables.) Set aside. Press the cooked pumpkin through a sieve to make fine puree. Mix in the glutinous rice flour in three batches. Use your clean hand to knead into a dough, until not sticky and not wet any more. 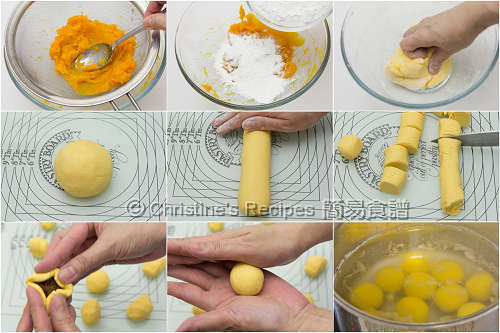 Transfer the dough to a clean surface and roll it out into a long tube shape, about 4cm / 1½ inches in thickness. Divide the dough into 12 equal portions. Wrap a heaped teaspoon of palm sugar with each dough portion. Knead it into a small ball. Repeat this step with the remaining dough. Bring the 3 cups of water into a boil. Add the ginger and pearl barley. Reduce the heat and simmer until the pearl barley turns soft. Add sugar and cook until it dissolves. Meanwhile, bring another large pot of water to boil. Carefully place the dumplings into the pot. Immediately stir the water and make sure each dumpling doesn't stick to the bottom. Cook over medium-high heat, until the dumplings float onto the surface of water. Transfer them into the pearl barley and sugar water. Add the yam. Cook for another 5 minutes. Serve immediately. Pumpkin contains high water content, so you don’t need to add any water when kneading with glutinous rice flour at the first place. Yet, if you find the dough is too dry, add some water bit by bit. If it’s too wet, add a little of glutinous rice flour. You can replace palm sugar with brown sugar slab (片糖, see picture here). It tastes equally good. Roughly chop the sugar and wrap it in each dough portion. 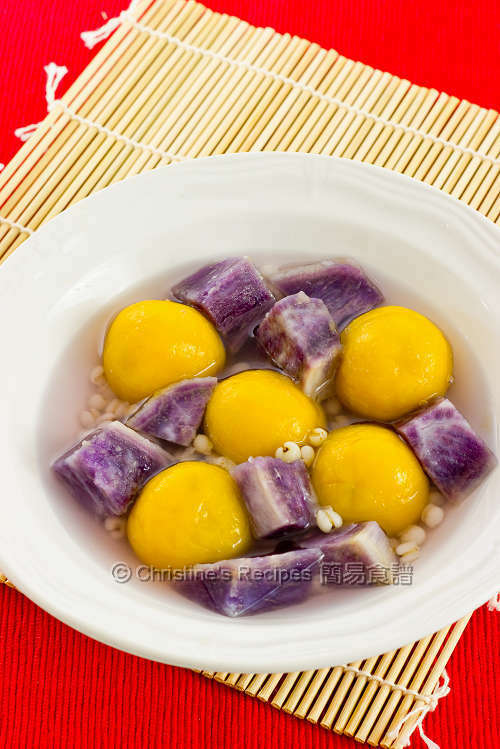 You can cook the yam in the sugar water if you don’t mind the soup turns purple. But if you want the soup looks clear, then use microwave oven. As the yam doesn’t have much water content, add a bit of water before cooking in a microwave oven with a lid on. Pearl barley can help increase a bit of texture, available at Asian grocers. You might omit it if you can’t find any. If you have small kids, you might like to use less ginger. oh man... i want to try this. your purple yam looks so good. its really hard to get purple yam here where i live :( I love the taste though. Great colour combination. I simply adore chewing the glutinous dumplings...slurp!! We had some delicious pumpkin dumplings for breakfast at the Zhe Bei Hotel in Huzhou. I think they had sweet bean paste inside. I will try them for sure.